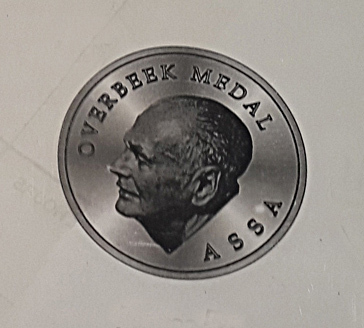 The Council of the Society established an award in October 2016 to be known as the Overbeek Award in honour of Daniel Michael Overbeek, one time President of the ASSA and prolific observer of variable stars. Awards shall be made from time to time as the President and Vice Presidents, hereafter called the panel, shall decide. Awards shall be made, without distinction of nationality or language, to any ASSA member and amateur astronomer whose observational astronomy has been published in a recognized astronomical journal, including MNASSA. The panel shall evaluate the nomination and certificate to bear the citation to indicate for what the award is made. The panel can consult suitably qualified referees to report on the nomination under consideration for an award. Procedure for making an award: nominations substantiated by written reasons, in respect of observational astronomy to be published in a journal of recognised standing, including MNASSA, within the previous five years, may be made to the ASSA Secretary by any member of the ASSA in good standing. (2008) along with Honorary Membership (2005) and a President’s Award (2006) of the ASSA. contributions to our understanding of these objects through his meticulous observations and detailed recordings of a large number of these events. These have been published frequently in MNASSA and other publications; both nationally and internationally. His presentation at the recent ASSA Symposium 2018 where he described his participation in the Cameras for All-sky Meteor Surveillance (CAMS) network in conjunction with the SETI Institute was one of the more significant papers at the Symposium. CAMS is to detect potentially hazardous asteroids/comets, PAHs, and this clearly demonstrated his capacity to develop observing equipment and his ability to collaborate internationally. His recent outstanding efforts in tracking down a bolide over Botswana has given the ASSA a prominent standing internationally, after a press briefing in Gaborone, Botswana, highlighting the details of this remarkable event, to be published in MNASSA. I can think of a no more deserving candidate for the Overbeek Award than Tim Cooper.